‘Twas the year 2005. I think. Anyway it was summer, and I was at the seaside with my friend Spleen. 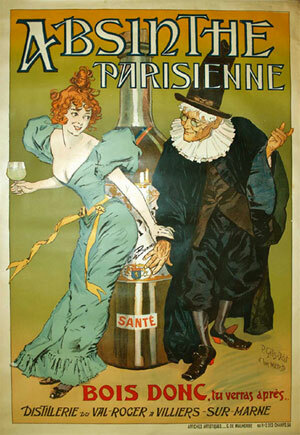 Come on, it’s titled “Absinthe” and there’s a friend named “Spleen”, you know where this is going to go. 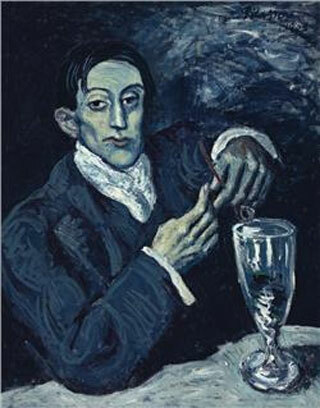 French quotes from Baudelaire? Check. New wave, gothi-ish influences? More! “Romantic” as in the artistic sense, and not as in flowers and chocolates? You bet. We were, in short, prepared, qualified. This is how we spent the summer: sleeping in late, going to the beach also late (with tons of sunscreen, we didn’t want to loose our unearthly pallor), out at night. One night at the pub, one night at the book stalls that sold books for 4 euros. We spent more in books that in booze (yet the Harp with blueberry syrup was quite good, at the pub). 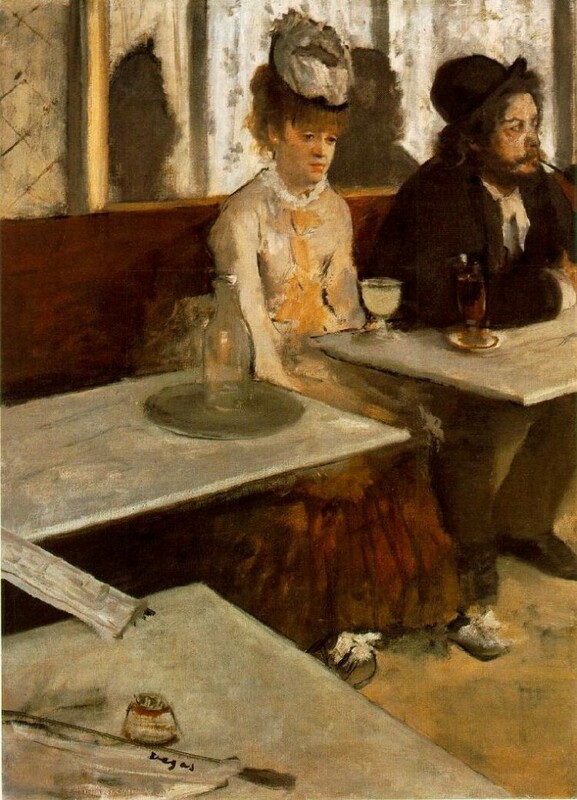 One day we decide to stop at a different bar (oh! The thrill of aventure) for a happy hour (before they were called happy hours). 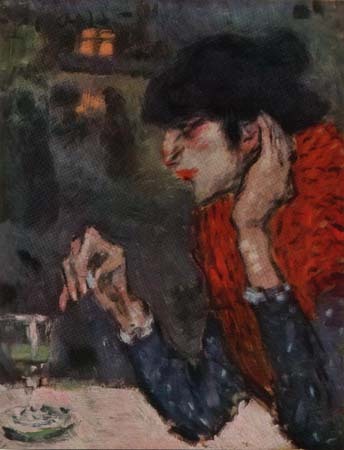 In the menu, we spot “absinthe”. 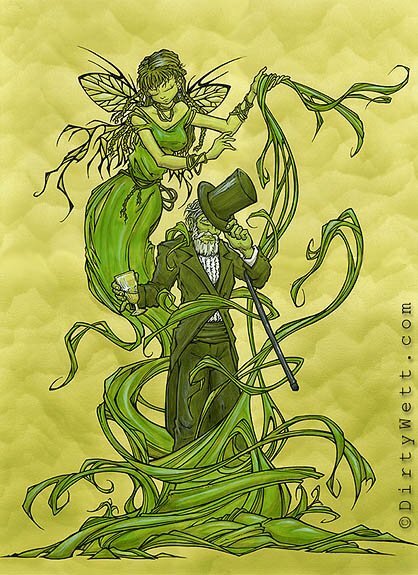 The following night we go there in full attire (aka those linen thingies sold at fairs, but it was long and black), we order absithe for two, we get to nice glasses, holed spoons, an inch of greenish stuff, and an alchemical looking alambic. Yeah, right, in a bar, on the seaside, they serve allucinogenic stuff. Riiiiight! Did I already mention that my friend and I had qualifications, right? You have to know that before that summer I learned a lot, from the internet of course! 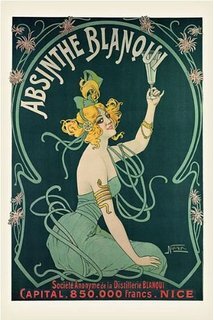 I found a forum of aficionados, read a lot, learned a lot of things that put off all that stuff and crap and myths about absinthe that are sadly still going around. So here’s this post, to give you a proper comeback in those cases, but most of all to save you from being one of those cases! 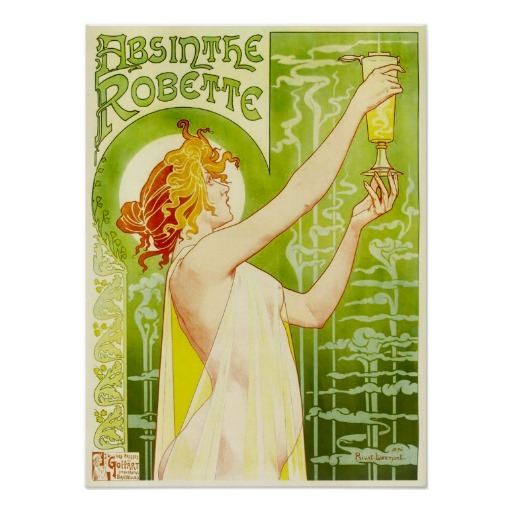 And since, while spring cleaning, I’ve found a drop of absinthe in our liquor cabinet (that I don’t think it’s going to be enough for the both of us) I thought of googling up that old forum. Mostly because there was an important contact: the italian seller! 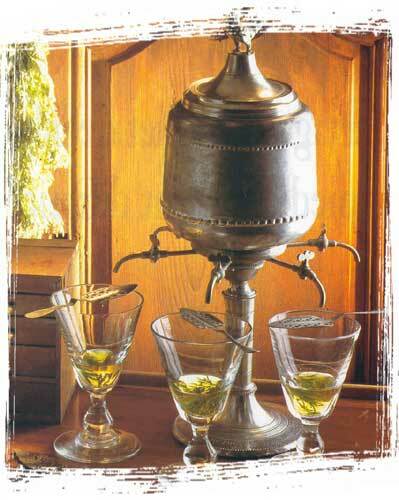 Anyway, here are some informations you might find useful in clearing up shtick about absinthe. As I said before: it’s not going to give you allucinations. Not even “the real deal” (you have no idea how many doucheboys I had to hear saying “If it’s not allucinogenic it’s not the real deal”). It is not. Period. 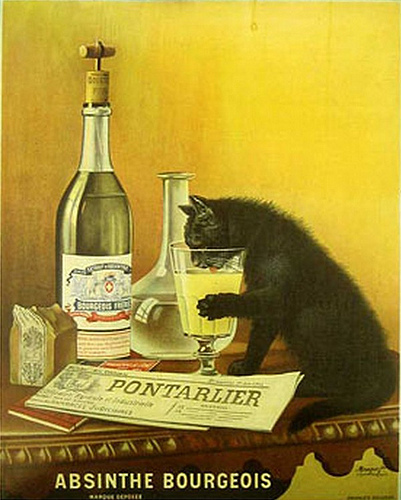 But anyway this isn’t related to absinthe itself. 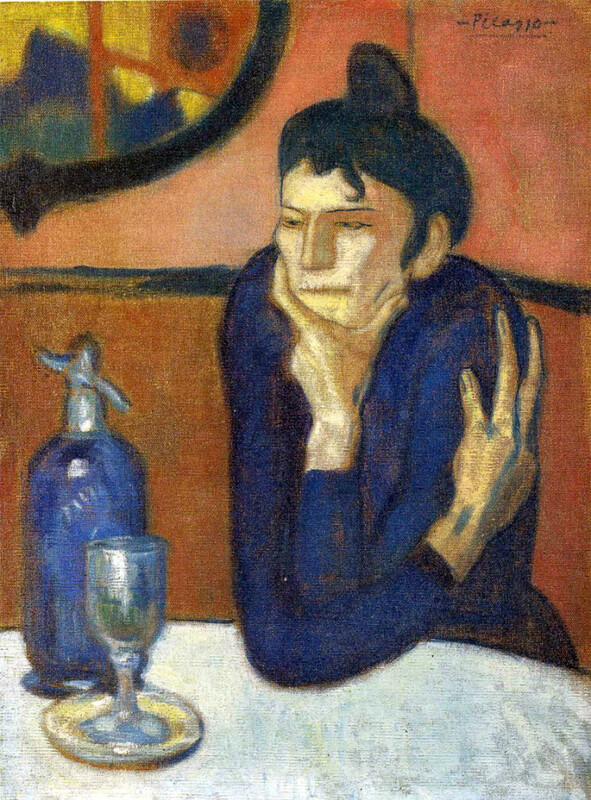 Not even “absinthe intoxication” is hallucinogen, not more than hallucinations from any type of alchool abuse. Those who play it a little bit more know-it-all “It’s the tujone that makes it spiked, like pot!”. Once again nope! Now, I wasn’t an ace at chemistry, back in high school (and trust me, it was way back), but the explanation here is that the content of tujone is sooooo small, that’s basically useless. You don’t set fire to it. Well, I mean, if you want to flambé it ’cause it looks cool, go ahead. But it’s like flambé-ing whiksey, you burn off all the alcohol. Yet you have no idea how many kiddos I heard saying they would drink it bottom up, ’cause you know, tough guys, 70° of alcohol, yaddayaddayadda… just after they burned it all away? You cannot make it at home. 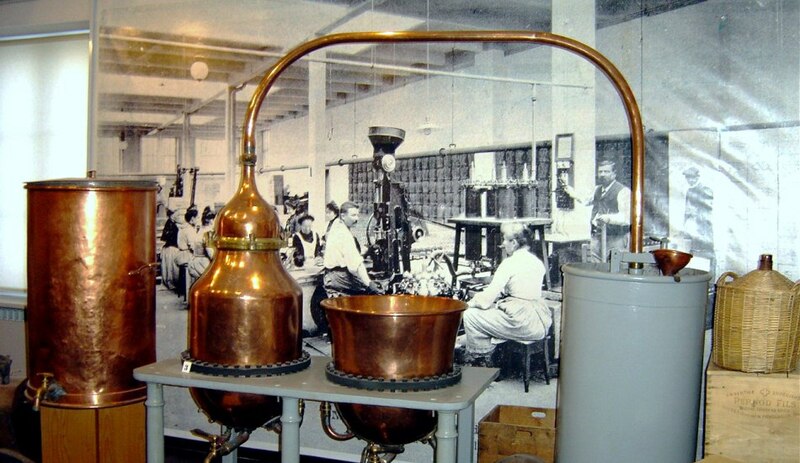 Well, technically, you could, you need a very good recipe, an alembic for distillation and being able to cut head and tail of a distilled spirit (if you do not wish to be poisoned, but not like “Oh, I see the green fairy” poisoned, more like “911? We’re losing him…” poisoned). So, as well, it’s not something you can do at home by maceration, like Limoncello, so to speak. But hey, what can a girl know about spirits, right? Go back to your Bacardi Breezer. La Fée brand? Nice bottle (and, if all else fails, I can stand it). Versinthe? Absentha? Stuff similar to that, possibly in a marvellous bright, highlighter green colour? Mouthwash with lots of alcohol. Mind me, I’m not saying it’s wrong to “like” those, everyone’s entitled to their own taste. But it’s like saying that Pampero is a good rhum. That boxed wine is a fine Cabernet-Sauvignon. It’s ok to like it. 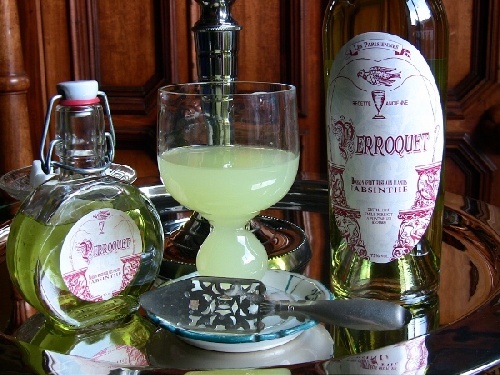 But it’s not absinthe. Not like a Montmartre65, an Elie Arnaud Denoix, or a Blanche de Fougerolles (just to name a few off the top of my head). 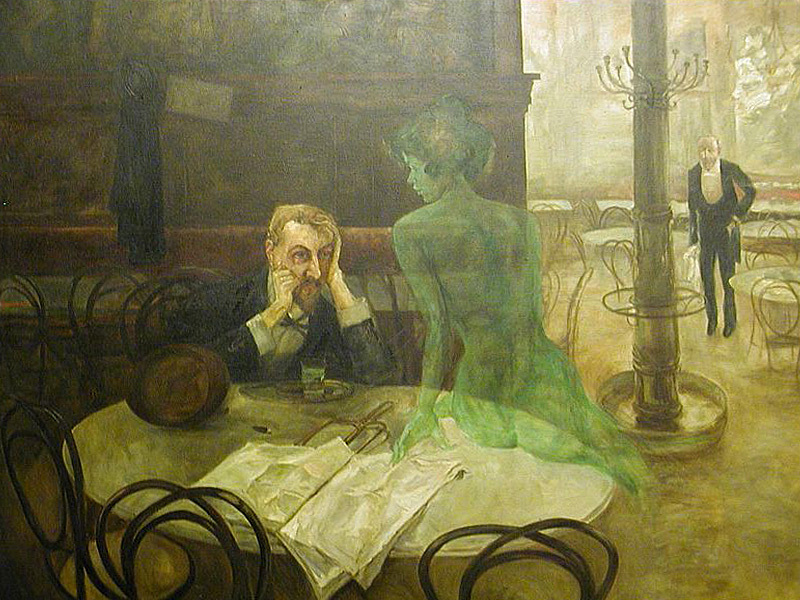 But then again, what can a girl know about spirits, so here are some links that are very informative about absinthe. 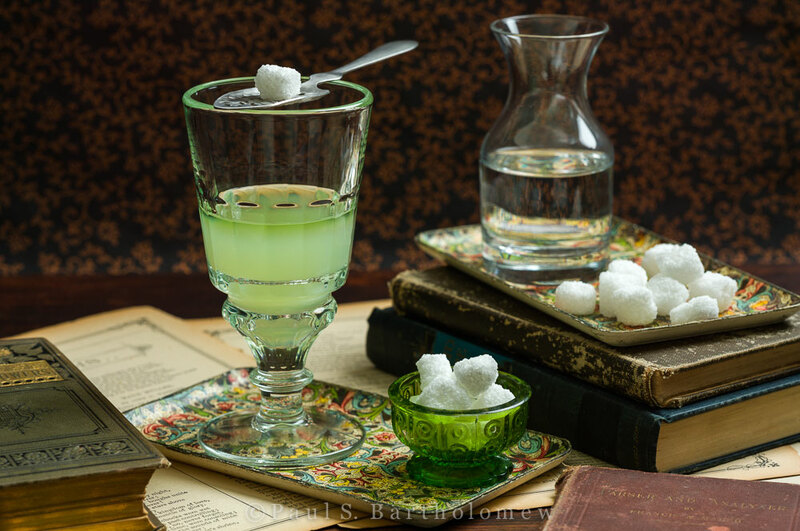 If you do not wish to read further those links, a part from what I’ve already wrote here, know that to spot a place where they know stuff about proper absinthe, is that it has to be served with icy water. Sugar is up to taste. The fountain (the alchemical thingie) it’s both functional and aesthetics. Chilled water has to drip down slowly. So that you can wait for “louche” effect, the cloudy-milky effect that icy water makes with the essential oils diluted in the spirit. It’s a “meditation drink” not a shot. Enjoy!